We all want to feel good in what we're wearing. Whether you're a stay-at-home mom or a career girl, knowing what is in your closet and not being overwhelmed by it will make your life simpler. I'm not going to give absolutes on how many items you must have in your wardrobe because all of us are different therefore our life requirement for clothing is different. I keep a super minimal wardrobe (about fifteen pieces) because I have that freedom ~ I work from home and I don't need formal work attire. BUT some of you at corporate jobs or fashion industries need what's suitable for that. You might be wondering how limiting yourself to a capsule wardrobe could help. I assume you've probably had the dilemma of standing in front of your packed closet wondering what to wear. I also bet that you have a few go-to pieces you wear as much as socially possible. What if your closet was full of only those type pieces ~ the pieces that fit you awesome, feel comfortable and make you feel amazing when you wear them? Does that sound better than trying to find that one top crammed in the middle of the closet you have to wrestle to get out? 1. A Capsule Wardrobe reduces stress. You go to your closet knowing that everything goes together and fits. You've chosen your colors, your patterns, your cut and style of clothes and you love them all. You pull out a top and know exactly which bottom you'd like to wear with it today. You don't have to scuttle through tons of accessories because you have a select few necklaces and scarves to choose from. It's almost like wearing a uniform, except that your uniform is culled to your preferences. 2. A Capsule Wardrobe helps you access your favorite clothes, because they're ALL your favorite. I know that sounds impossible but stay with me. Say you only have 20 pieces of clothing in your capsule wardrobe (don't panic I'm not going to make you only have 20, this is just an example) and all of them have been purposely selected by you because they feel good on and they accent your best features. You are no longer digging through all those colors you thought were cute but never looked good on you; or the jeans that you thought fit you well until you wore them for a day and hated how you had to keep pulling them up; or the dress that always seems to call your name but when you put it on it emphasizes your middle. Having a capsule wardrobe eliminates all this frustration because the only things hanging in your closet are your favorites. 3. A Capsule Wardrobe sets you apart; you are able to take ownership of your style. When you are able to weed through your mass of clothing to your favorites, you will discover your style and what actually looks best on you (without worrying so much about fads). You will understand a little more about yourself. Are you bold and colorful? Are you dressy and classic? This process will help you establish what it is you love about yourself and how you present that with your clothes. (I share more about that process next Wednesday) You will feel your best and it will set you apart from others because you will have a style all your own. When you have a style, people notice. I have a friend that always looks put together. She often wears a simple top with a jersey skirt and sometimes a necklace. When I see her, I don't think "shirt and jersey skirt"; I think "put-together". Her style is simple but sweet. Looking "put-together" is easy with a mixable capsule wardrobe. 4. A Capsule Wardrobe saves money. Knowing what you have and what you need are two components often missing when we go shopping. I have scoured sale racks and brought home things that were really marked down that I never wore past one time because although in fashion, it went with nothing else in my closet or it was really not my style. Having a capsule wardrobe helps you understand what types of clothing/colors work for you and what to put back on the sale rack. 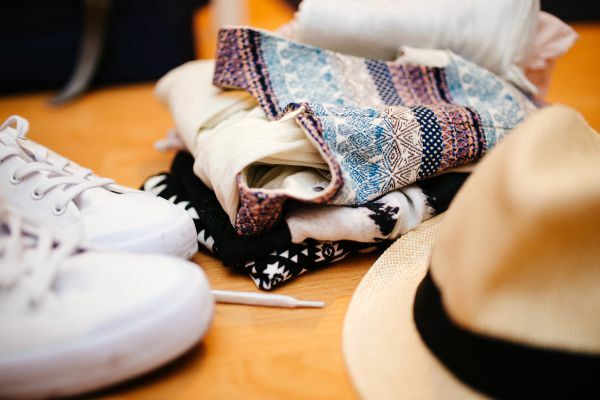 Saving money from "guesswork shopping" will help you have extra funds for replacing a favorite piece when it wears out with a better quality item. 5. A Capsule Wardrobe saves time. I can't tell you how many times I've been rushing to get ready trying on a plethora of outfits only to have nothing work, either it fit awful, one piece was in the laundry, or nothing matched. It's so frustrating to think you have an outfit ready to go only to realize there's a tear, or a button missing. With a capsule wardrobe, everything goes together so if I realize one top has a stain, it's easily fixed by grabbing the next one on the rack. My mornings are calm now and getting ready goes so fast. I love how everything fits so I'm not wasting time trying on stuff that doesn't work. 6. A Capsule Wardrobe means that buying less gives you the option to buy better. When I say "better" I mean two things: quality and fair trade. Since you'll be buying less and staying within your capsule wardrobe, you'll be able to save the money you might have spent on unneeded sales items to purchase great quality. Quality clothes are more durable and save you even more money in the long run. It also enables you to buy from ethical companies who have to charge more to be sure their workers are receiving a fair wage. It's good for you and it's good for others. 7. A Capsule Wardrobe reduces consumption and saves the earth. We are such a consumeristic society and we continue to send the message to companies to keep producing MUCH more than is truly needed because we keep purchasing crazy amounts each year. Landfills are full of our over-consumption. What would happen if we all stopped buying so much? I don't think it would take long for companies to back off production to avoid a huge loss. It may seem like a little thing to reduce your spending by reducing your wardrobe but it actually helps the world. We're not only stopping over-production but we're changing the mindset and message that "more is better". By changing our mindset, we change the future. A capsule wardrobe may sound limiting but I've found it to be extremely freeing. Intimately knowing every piece in my closet helps me decide on outfits quickly and feel good in them. It doesn't matter that I don't have a perfect figure, I've culled my clothing and kept only those items I love that work with my body shape. Knowing everything fits and enhances my body gives me confidence for whatever the day holds. Have you ever considered creating a capsule wardrobe? I am actually in the process of culling my wardrobe, so this came at a perfect moment for this post for me! Since I'm at the end of my maternity and body recovery period, the first question I'm asking is "Does it fit well?" and the second is "Do I love it?" If the answer is no to either of those (because there are indubitably items that I love that are just awful), they go straight to the donate pile. Thank you for the further inspiration and welcome back from your blogging vacay! Kimberly, I'm so glad it resonated with you. Sounds like you're already on a great path of simplifying your life, which I imagine would be especially helpful after maternity! I love those two questions and use them often! !